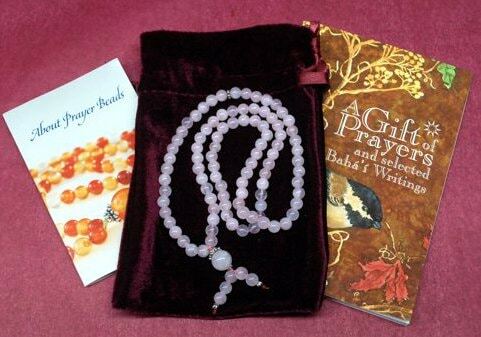 Each set of 95 6mm Bahai prayer beads comes with a copy of the Gift of Prayers and a fold-out instruction sheet with prayers, pronunciation guide and explanation of some of the many ways to use prayer beads. They are also packaged with a velvet, drawstring pouch. Folk wisdom says bloodstone is the gem for returning your spirit to a natural state of joy and vitality. 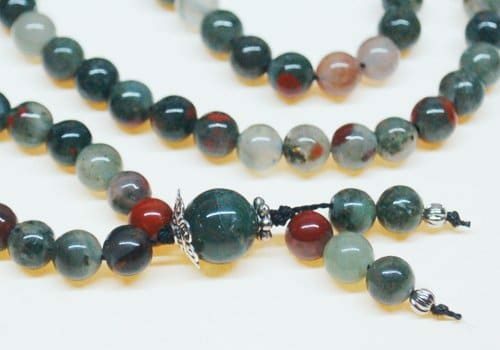 African bloodstone is a varying form of chalcedony that includes opaque mossy green and brick reds, all in an agate base. I would summarize this by telling you it is a heavy, attractive stone in earthy colors. 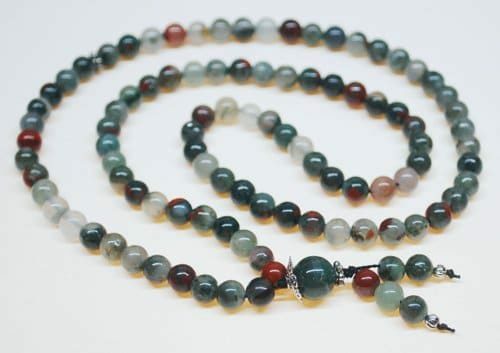 We string our Bahai Prayer Beads with 95 semi-precious stones plus 5 counter beads. Since we use them ourselves, we string the beads loosely. This way they pass easily between your fingers as you pray. Each set of prayer beads comes with a copy of the Gift of Prayers as well as a fold-out instruction sheet. This contains common prayers, a pronunciation guide and an explanation of some of the many ways to use prayer beads. The set comes packaged in a velvet, drawstring pouch. The beads are 6mm round which makes the strand about 22-23″ inches in circumference. This allows them to double as a necklace for people who wear a small hat size. The care and craftsmanship we put into stringing the beads mirrors the delicate beauty of the beads. Each stone is like a little work of art with God’s signature shining out. The moderate price for a hand-crafted item makes them excellent gift. Think of prayerbeads as gifts for special occasions like birthdays, Holy Days, anniversaries, graduations, or when someone becomes a Bahá’í. The quality is unconditionally guaranteed, but please read the description of the size of the bead and the length of the strand because there is a 10% restocking fee if they are returned because they aren’t the size you expected. Click here for an article by a Baha’i about some of the many benefits of saying the Greatest Name 95 times.